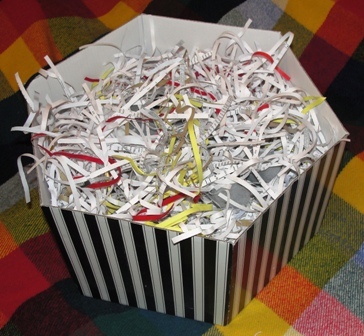 Following on from our ‘Shredded Paper Play’ activity, I found another redundant box, filled it with more shredded paper & added a variety of objects to create a Storytelling Box! The objects included; cuddly toys & toy figures, a toy spade, ball, a wand, a spoon, paintbrush, bowl, bear ears, a shell, hammer, a pebble, whistle, & tractor. The great thing about this activity is the random nature in which these items will come out of the box, therefore the story unfolds as you pull out each item. 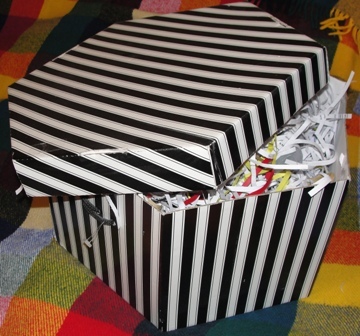 Here is a special Storytelling Box for you. I created a story focusing on the objects Minnie pulled out of the box, sometimes more than one object came out, & another was eagerly searched for immediately, but it didn’t matter as the tale was hers to discover & tell. Our Koala (Bruce) went on quite an adventure; he made a cake, went to the beach & had a picnic, got stuck in the mud, met a fairy who played magic music (on a flute) & went to a birthday party, amongst other things. We moved around the room while telling the story, waved our arms for the movement of the sea, pretended to dig in the sand with our spade, & mixed ingredients together for a birthday cake with our spoon & bowl. To compose a story whilst acting in it, & not know where it would end was just such fun! What a great activity for encouraging imagination, communication skills, knowledge & understanding of the world, creativity, & language development. Babies would enjoy the ‘peek-a-boo’ aspect of objects popping out from the box & listening to the story while observing & playing with the objects. Older babies/toddlers could join in by exploring the objects & join in with newly discovered words. 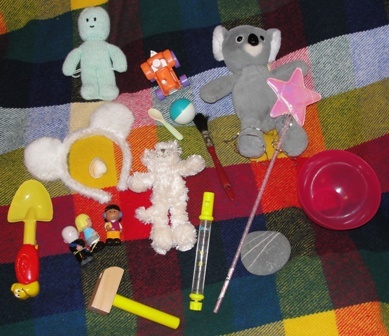 Older children could tell their own story using the props... it's amazing what one box could offer! Hope you have fun discovering lots of stories too.